Simple stuffing boxes filled with proprietary packing material. Lip seals, in which a number of flexible membranes in contact with the shaft, prevent the passage of fluid along the shaft. 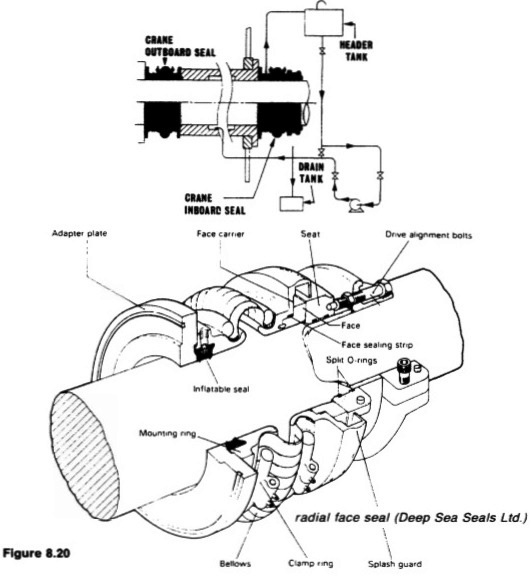 Radial face seals, in which a wear-resistant face fitted radially around the shaft, is in contact with similar faces fitted to the after bulkhead and to the after end of the stern tube. A spring system is necessary to keep the two faces in contact. 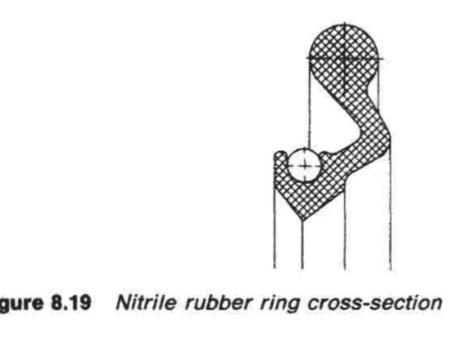 A lip seal assembly (Figure 8.18) consists of a number of nitrile rubber rings of special cross-section (Figure 8.19) sandwiched between bronze rings. Each individual rubber lip seal is held in contact with a renewable sleeve fitted to the shaft by its elasticity and a garter spring. The rings are renewed by cutting and then vulcanizing the ends in situ. The Simplex stern tube (Figure 8.15) has a forward seal with two rings and an after seal with three rings. 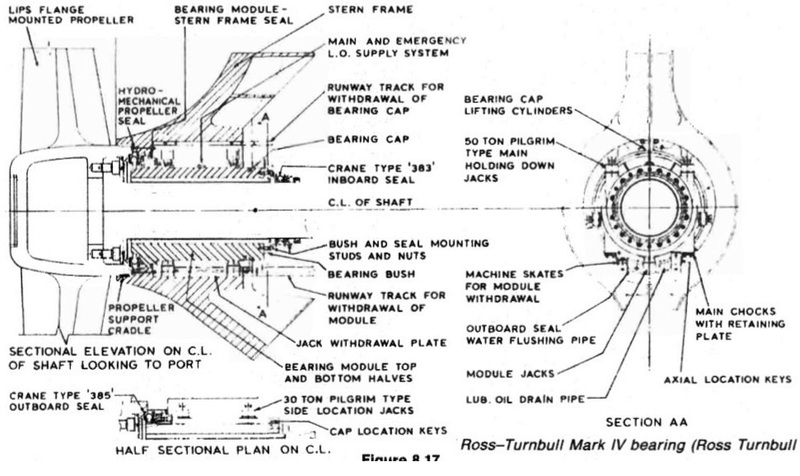 A larger sketch of the after seal (Figure 8.18) shows how seals are built up from three basic assemblies namely the flange, intermediate, and cover rings and these parts can be used for either seal. It will be noticed that the garter spring holding the sealing ring against the shaft is located aft of the ring anchoring bulb in the case of both forward sealing rings. 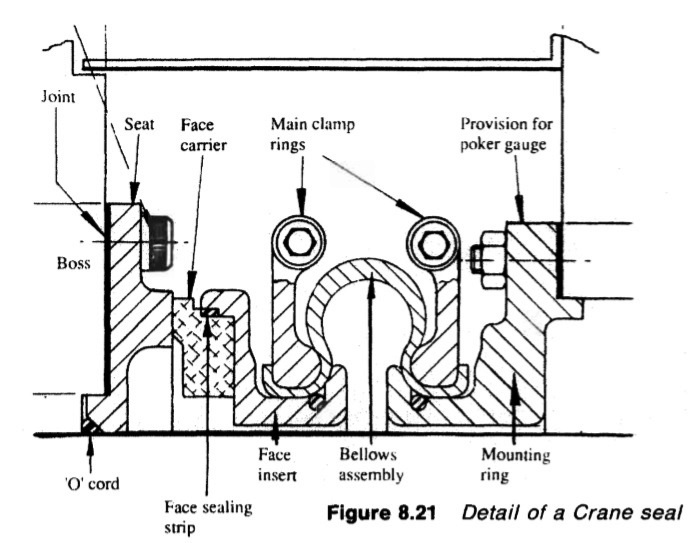 In the case of the after seal the two outboard sealing rings have their garter springs located aft of the ring anchoring bulbs while the inboard ring has its garter spring located inboard of the anchoring bulb. Lip seals will accept misalignment but a floating ring design was introduced by one manufacturer. An example of a radial face seal, is shown in the general arrangement (Figure 8,20) and a detailed sketch (Figure 8.21) of a Crane seal. One of the principal features of the design and construction of this type of seal is the split construction of all component parts. This facilitates installation, and subsequent inspection and maintenance. The function of sealing against leakage around the shaft is effected by sustaining perfect mating contact between the opposing faces of the seal's seat which rotates with the shaft, and of the main seal unit which is stationary and clear of the shaft. This mating contact of the seal faces, which are hydraulically balanced, is sustained by spring pressure and by the method of flexibly mounting the face of the main seal unit. The flexible member consists of a tough, but supple, reinforced bellows. Thus the main seal unit is able to accommodate the effects of hull deflection and vibration. The bellows member is clear of the shaft, and its flexibility therefore cannot be impaired, as may happen when a flexible member is mounted on the shaft and hardens, seizes or becomes obstructed by a build-up of solids. The mechanical design principles also ensure continued sealing under fluctuating pressure conditions, i.e. changing draught.